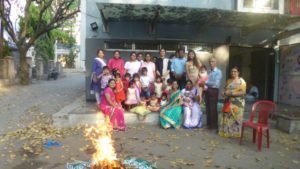 Shivratri was celebrated by taking children to the temple of lord Shiva. 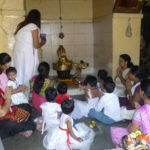 The children were also taken to the Tarkeshwar Shiv Mandir later . 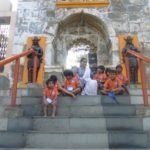 Children were told about the temple and some stories of Lord Shiva. Maha Shivaratri is a Hindu festival celebrated annually in honor of Lord Shiva, and in particular, marks the day of the marriage of Shiva. There is a Shivaratri in every luni-solar month of the Hindu calendar, on the month’s 13th night/14th day, but once a year in late winter (February/March, or phalgun) and before the arrival of Summer, marks Maha Shivaratri which means “the Great Night of Shiva”. It is observed by remembering Shiva and chanting prayers, fasting, and meditating on ethics and virtues such as self-restraint, honesty, non-injury to others, forgiveness, and the discovery of Shiva. The ardent devotees keep awake all night. Others visit one of the Shiva temples or go on pilgrimage to Jyotirlingams. Children enjoyed the traditional way in which Holi is celebrated in Maharashtra. They also enjoyed the stories related to the festival and relished the feast of Puranpoli. Holi is a Hindu spring festival celebrated in India and Nepal, also known as the “festival of colours” or the “festival of love”. The festival signifies the victory of good over evil, the arrival of spring, end of winter, and for many a festive day to meet others, play and laugh, forget and forgive, and repair broken relationships. It is also celebrated as a thanksgiving for a good harvest. It lasts for a night and a day, starting on the evening of the Purnima (Full Moon day) falling in the Vikram Samvat Hindu Calendar month of Phalgun, which falls somewhere between the end of February and the middle of March in the Gregorian calendar. The first evening is known as Holika Dahan or Chhoti Holi. 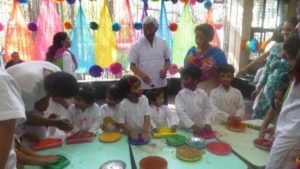 Children had a merry time playing with colours on the Ranga Panchami day. The volunteers and staff members played with the children. It was a joyous occasion for all. Rang Panchami is a festival celebrated 5 days after Holi, that’s Phalgun Krushnapaksh Panchami, so called panchami. It is celebrated by applying colours to each other. 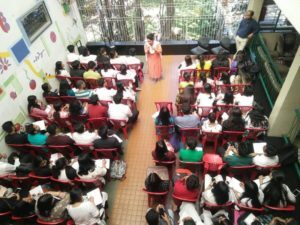 The volunteers play an important role in the day to day activities at Shreevatsa. Their time and selfless love is worth a lot for the children. 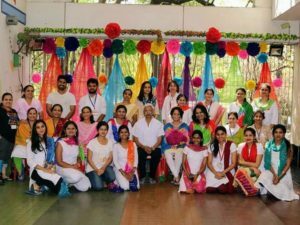 Students from law colleges, nursing colleges and schools etc. visit Shreevatsa to understand the various aspects of health, legal proceedings and management. These visits are very interactive and they increase out outreach.